Even Superman needed to retire to a phone booth for a quick change. But now scientists at the Stanford University School of Medicine have succeeded in the ultimate switch: transforming mouse skin cells in a laboratory dish directly into functional nerve cells with the application of just three genes. The cells make the change without first becoming a pluripotent type of stem cell — a step long thought to be required for cells to acquire new identities. The finding could revolutionize the future of human stem cell therapy and recast our understanding of how cells choose and maintain their specialties in the body. “We actively and directly induced one cell type to become a completely different cell type,” said Marius Wernig, MD, assistant professor of pathology and a member of Stanford’s Institute for Stem Cell Biology and Regenerative Medicine. “These are fully functional neurons. They can do all the principal things that neurons in the brain do.” That includes making connections with and signaling to other nerve cells — critical functions if the cells are eventually to be used as therapy for Parkinson’s disease or other disorders. Wernig is the senior author of the research, published online Jan. 27 in Nature. Graduate student Thomas Vierbuchen is the lead author. Although previous research has suggested that it’s possible to coax specialized cells to exhibit some properties of other cell types, this is the first time that skin cells have been converted into fully functional neurons in a laboratory dish. The change happened within a week and with an efficiency of up to nearly 20 percent. The researchers are now working to duplicate the feat with human cells. Until recently, it’s been thought that cellular specialization, or differentiation, was a one-way path: pluripotent embryonic stem cells give rise to all the cell types in the body, but as the daughter cells become more specialized, they also become more biologically isolated. Like a tree trunk splitting first into branches and then into individual leaves, the cells were believed to be consigned to one developmental fate by physical modifications — called epigenetic changes — added to their DNA along the way. A skin cell could no more become a nerve cell than a single leaf could flit from branch to branch or Superman could become Clark Kent in midair. That view began to change when Dolly the sheep was cloned from an adult cell in 1997, showing that, under certain conditions, a specialized cell could shed these restrictions and act like an embryonic stem cell. And in 2007, researchers announced the creation of induced pluripotent stem cells, or iPS cells, from human skin cells by infecting them with four stem-cell-associated proteins called transcription factors. Once the cells had achieved a pluripotent state, the researchers coaxed them to develop into a new cell type. The process was often described in concept as moving the skin cells backward along the differentiation pathway (in the leaves analogy, reversing down the branch to the tree’s trunk) and then guiding them forward again along a different branch into a new lineage. Finally, in 2008, Doug Melton, PhD, a co-director of Harvard’s Stem Cell Institute, showed it was possible in adult mice to reprogram one type of cell in the pancreas to become another pancreatic cell type by infecting them with a pool of viruses expressing just three transcription factors. As a result, Wernig, who as a postdoctoral fellow in Rudolf Jaenisch’s laboratory at the Whitehead Institute in Massachusetts participated in the initial development of iPS cells, began to wonder whether the pluripotent pit stop was truly necessary. Thomas Südhof, the Avram Goldstein Professor in the Stanford School of Medicine, also collaborated on the research. To test the theory, Wernig, Vierbuchen and graduate student Austin Ostermeier amassed a panel of 19 genes involved in either epigenetic reprogramming or neural development and function. They used a virus called a lentivirus to infect skin cells from embryonic mice with the genes, and then monitored the cells’ response. After 32 days they saw that some of the former skin cells now looked like neural cells and expressed neural proteins. The researchers, which included postdoctoral scholar Zhiping Pang, PhD, used a mix-and-match approach to winnow the original pool of 19 genes down to just three. They also tested the procedure on skin cells from the tails of adult mice. They found that about 20 percent of the former skin cells transformed into neural cells in less than a week. That may not, at first, sound like a quick change, but it is vast improvement over iPS cells, which can take weeks. What’s more, the iPS process is very inefficient: Usually only about 1 to 2 percent of the original cells become pluripotent. 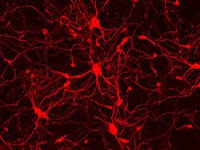 In Wernig’s experiments, the cells not only looked like neurons, they also expressed neural proteins and even formed functional synapses with other neurons in laboratory dish. “We were very surprised by both the timing and the efficiency,” said Wernig. “This is much more straightforward than going through iPS cells, and it’s likely to be a very viable alternative.” Quickly making neurons from a specific patient may allow researchers to study particular disease processes such as Parkinson’s in a laboratory dish, or one day to even manufacture cells for therapy. The research suggests that the pluripotent stage, rather than being a required touchstone for identity-shifting cells, may simply be another possible cellular state. Wernig speculates that finding the right combination of cell-fate-specific genes may trigger a domino effect in the recipient cell, wiping away restrictive DNA modifications and imprinting a new developmental fate on the genomic landscape.